India’s building boom is petering out. Many large realtors are in dire financial straits, their shares have been battered and real estate prices are dropping. As with all economic transitions, this one too has both good and bad aspects. The good comes from the fact that the vertiginous rise in real estate prices over these past five years had put home ownership outside the budgets of most Indian households. 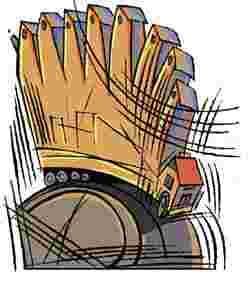 Even a small flat in a city such as Mumbai was priced at close to Rs50 lakh. Few urban families can put that sort of money on the table at one go or comfortably service the hefty mortgage needed to buy such a house. Add to that the fact that realtors moved aggressively upmarket to sell spacious homes to the relatively rich. That is the good news. But there is a dark underside to the woes of the real estate sector. Construction activity now accounts for one-tenth of India’s non-agricultural gross domestic product (GDP). It has been one of the fastest-growing parts of the economy. It also offers millions of jobs to unskilled workers who flee rural misery. Six out of every hundred working Indians are employed in construction activities. The Planning Commission estimates that at least one-fifth of the 115 million new jobs likely to be created between 2006 and 2016 will be in construction. That is more than new jobs expected from manufacturing. Static cranes and silent jackhammers are bad news in this context. Construction is now a very important source of economic growth and employment. It has strong linkages to other parts of the economy, from the steel and cement needed to build homes and offices to the washing machines and air conditioners needed to make them liveable. Some of the pain was inevitable. India was part of a larger real estate bubble that was inflated around the world since 2002 by loose monetary policies. Its bursting was unavoidable and the waves of financial destruction originated in this real estate bubble. Keeping it inflated would have meant even more damage down the line.